Foo Fighters frontman Dave Grohl has fallen off stage in Las Vegas after being handed a can of beer by a fan while playing a guitar solo. It is not the first time the flamboyant musician has taken a tumble: he fell and broke his leg during a gig in Gothenburg in 2015, and then appeared to do the same, in the same city, earlier this year. 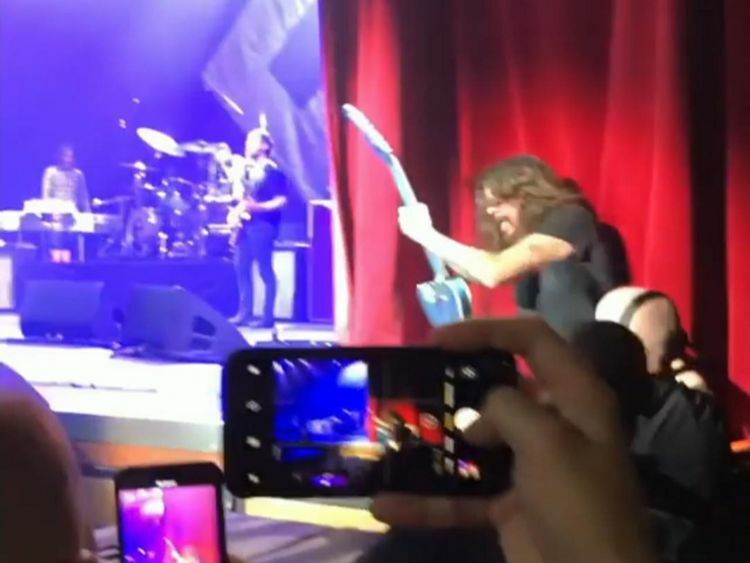 Playing the band’s first gig of 2019, Grohl strolled over to one corner of the stage, stepped down to a lower level, shook hands with a fan and accepted the beer as it was passed forward through the crowd. After placing it on a speaker, he tried to sip some of the drink from the upright can as he continued to play, knocking it over and soaking the speaker with foam. Rescuing the drink, he then took a long swig, restarted his solo and climbed back up to the main stage before falling backwards and being caught by shocked security guards. He recovered quickly though, jogging back to his fellow band members. It may be a new year, but it appears to be the same old Dave Grohl.